It is not exactly simple but I like the way it looks…I outlined the basket and flowers then also quilted about 1/4 inch inside each petal, and echo quilted the basket, and added a 1/2″ grid to the background…on the sashing I am doing a free hand vine pattern (I didn’t have a template on hand that fit ). I think the quilting enhances the piecing more than an overall pattern like the Baptist fans that I used for the last quilt. Next I have to move to the next block. I always start in the center of the quilt and work to the outside…this way if there are any puckers I can smooth them out to the edges as I go. 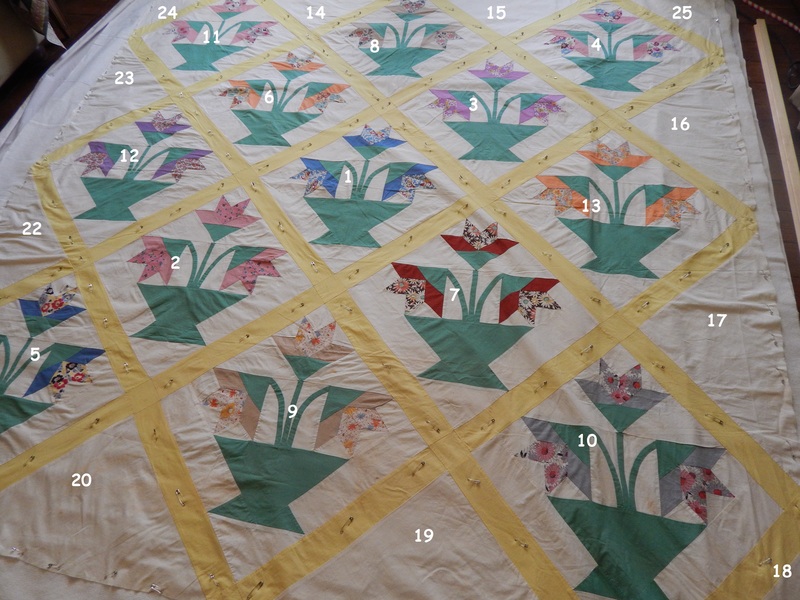 I added some numbers to this picture of the quilt so you can see what order I will quilt the blocks in. so the next one to quilt will be the block with the pink flowers. It takes me a few days to do one block so this wont be a fast finish, but I am very happy with how it is looking. Come back soon to see more. 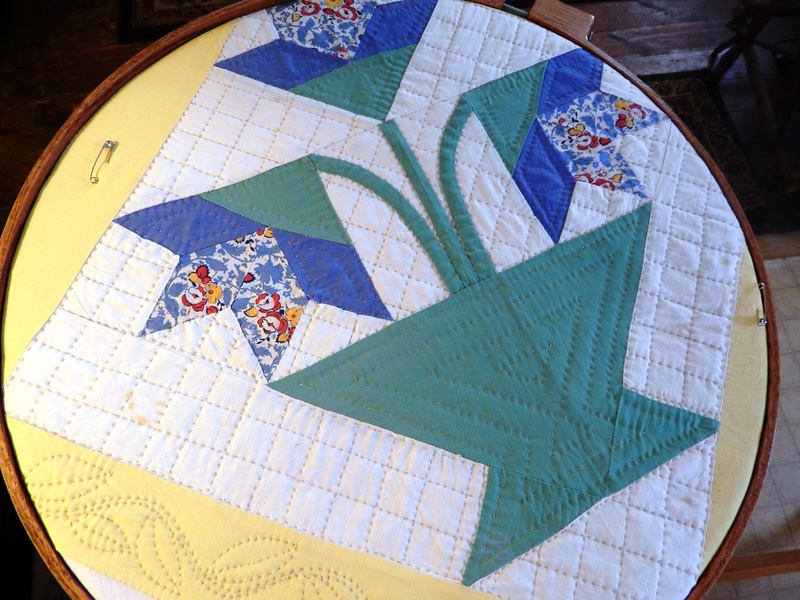 This entry was posted in Quilts and tagged basket of lilies, hand quilting, Quilting, Quilts, vintage quilt top. The vines are a great idea! It’s going to be just beautiful. I simply LOVE the detailed explanation of this. Perfect…..keep posting please. Did you ‘freehand’ the backround grid too? This is exactly how I start my handquilting. Start in the center and work out. Thank you again so much. All the quilting looks great and enhances the pieced parts of the quilt. I’m glad to have you back in the blogging world: I missed hearing from you when you went silent for a couple of months! Thanks Laura!….Thje last few months I really missed quilting and blogging as well, but sometimes other things get in the way and take priority…but even when Im not quilting and blogging I am thinking about it!! I love the way you are quilting this. The crosshatching in the white field around the piecing is perfect for the geometric feel of the flowers. Then the vine pattern in the sashing is a nice soft counterpoint to the other quilting. Another great project!! Looking forward to seeing it as you go along. very nice. I sometimes believe the quilt tells us what quilting it needs, regardless of how simple we ant to keep it! Luckily you enjoy every stitch. Sometimes I get to hating the quilting, wondering why I ever made it so much work, but the result is a happy one. Your results are always happy! I like the way this quilt is looking. You quilt the way I think things should be quilted. Thanks for sharing. Oh, this quilting is just right for this quilt! And with the warmer temperatures and sunshine today, it’s the perfect time to be working on a spring quilt. Have fun! Your quilting just adds that much more beauty to an old pattern! Wonderful work! Perfect choice of quilting, Tim. Fits with the age of the top. Love your attention to detail and your approach for the sashing. Think modern day quilters get so wrapped up using a stencil that they forget, or maybe don’t realuze, that originally quilters didn’t use stencils but rather free handed it just like you’ve just done. Thank you, once again, for being such a sharing person. Thanks Annette!….I love sharing what I even more when I know that it is appreciated! Oooh, that speaks to me. Or rather Tim the Quilt-Top Whisperer spoke with the quilt top. Appropriate, elegant, beautiful. I think that your intuition, based on artistic visualization and experience, is without a question valid. And on the other extreme was that quote I sent you from a machine quilter, “the pattern was straight lines, so I chose a curved and circular pattern to quilt it.” Yeah. Absolutely gorgeous! Inspires me to get my mother’s ‘Grandmother’s Flower Garden’ top sandwiched & get going with the hand quilting. I wish I could bring it over & have you give some advice on it. I got bamboo batting, so hope it works well. It’s been sitting around for over 20 years waiting. I’ll let you know when I get it started. Tim, your quilting is exquisite! I love to hand quilt. It’s so good to find others out there that are still hand quilting! Thank you Judy and Welcome!…we hand quilters need to stick together!! That will be one of your best! WOW! My mother always used narrow masking tape to crosshatch, the kind that didn’t leave residue. She was a good crosshatcher, but doesn’t quilt anymore, she’s in to knitting (age 95 next month). age 95… and still knitting…now that is something to aspire to! Thanks for all of your tips and for sharing the techniques you’ve discovered that work well. You share generously (I’ve missed you) and I’m sorry that I don’t say thank you more often! Thank You Melissa!….I really enjoy doing it….and even more when I know it is helpful to you and appreciated!! Love this! I want to do one as my great grandmother died when my grandmother was only 3 years old. She left my grandmother some blocks she had done in the red and green and white. ( I am 70 so that was a loooong time ago, lol) If I am not mistaken, her blocks were either 6 inch or 8 inch….I believe they were 8 inches square. I can’t quite figure out how to piece them together. Any suggestions would be greatly appreciated. Or if you know of a video tutorial somewhere that would be wonderful! Thanks for sharing. I am not sure what you are asking, do you need a pattern ?